You are here: Home / News / Alvetex on the International Space Station! Alvetex Scaffold products allow researchers to overcome the limitations of growing cells on flat surfaces by creating a unique three dimensional (3D) surface that allows cells to form tissue-like structures in an in vitro setting. A team from Massachusetts General Hospital investigating bone loss during bed rest and diseases such as osteoporosis, has incorporated Alvetex Scaffold in experiments 150 miles above the surface of the Earth after the equipment is delivered to the ISS by the SpaceX Dragon capsule. Assistant Prof. of Medicine Paola Divieti Pajevic’s group has been successfully using Alvetex Scaffold to culture murine osteocytes in 3D to better mimic in-vivo growth conditions. Their long term aim is to understand the mechanisms of bone loss during unloading as occurs during prolonged bed rest, microgravity and in diseases such as osteoporosis. The group has received funding from NIH and NASA to perform these experiment on the International Space Station. The group will culture osteocytes in bioreactors that will automate the process of feeding the cells during the ISS mission. This automatic system was specially designed by their implementation partners, CALM Technologies Inc.
Dr. Divieti Pajevic’s group looked at many different systems for 3D cell culture, and ultimately needed a simple product that is compatible with histology, imaging and reliable recovery of total RNA to study gene expression profiles. Alvetex Scaffold was one of the few commercially available products that met all these criteria. 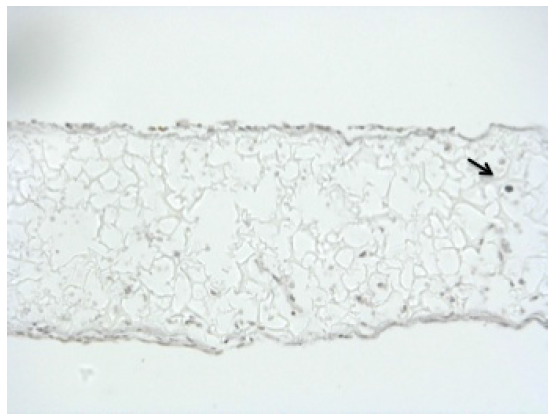 Tunel staining of OCY454 in Alvetex®Scaffold. 10 μm sections of paraffin embedded scaffolds were stained by Tunel. Tunel assay (IHC) in cells cultured for 7 days in flight certified bioreactors. The extremely low level of Tunel positive cells (black staining) present under these conditions indicates a very low level of cell death and that cells can be maintained in culture conditions necessary to fly cells to the International Space Station.